The basic question: What size or tonnage should be chosen? When we say that we require 1 ton or 1.5 ton air conditioner, does that imply that we are talking about its weight? Definitely no. Here, ‘ton’ refers to the amount of heat removed by the air conditioner in one hour. The amount of heat removed is measured in British Thermal Units (BTU). Hence, higher the BTU, greater will be the cooling capacity, which means the AC will be able to cool a larger area. 2 ton= 24,000 BTU/hr and so on. Historically a ton was referred to as a space that can be cooled using 1 ton of ice. And that is how the term originated. Now that we know what the term ‘ton’ implies, our next step would be to choose the right ton air conditioner. Frankly, there is no universal answer to this question. The tonnage depends on several factors like room size, city of use, number of people in room, number of appliances in room, etc (more in our article: Things that impact electricity consumption in air conditioners). Also the tonnage not only depends on the factors listed earlier, but also on the season. In peak summers when there is more heat, more tonnage is required to cool a room, whereas in the month of March, it is lesser (more in our article: Electricity Bills vary with seasons and how Inverter Technology can help). Even between day and night the tonnage requirement varies as more tonnage is required during the day (as heat is more) and less tonnage is required during the night (as heat is less). However, whenever we choose the tonnage, we have to keep the peak summer day in mind and choose accordingly. Our article on ‘Split vs Window’ air conditioner elaborates more on the factors affecting AC size selection. Buyers should make sure that they select optimum size of air conditioners. This is because undersized air conditioner cannot cool properly and oversized AC consumes more electricity (to know the reason read: Power Saver Devices for Air Conditioners). And a fixed speed air conditioner if sized for the peak summer day will be oversized during most other times (in comparison Inverter Technology air conditioners automatically adjust their tonnage as per room’s requirement at any point, read more at: Air Conditioners with Inverter technology can help save electricity). The reason we prefer these calculators is that they show more detailed tonnage requirement for the room. Most others round up the number resulting in oversizing (for e.g. many other calculators will round up 1.2 ton to 1.5 ton whereas there are many brands that do make ACs of 1.2 tons and it is better to go for 1.2 ton AC than 1.5 ton in order to avoid oversizing). Also please note that if you buy a BEE 5 star rated 1.5 ton AC for a room that needs 1.2 tons of cooling, it will be as good as buying a BEE 3 star 1.2 ton AC (oversizing causes inefficiency which will result in extra electricity usage). The next and a very important differentiating factor between air conditioners is the efficiency. Efficiency in basic terms is defined as output/input. 1.Energy Efficiency Ratio or EER. EER = Amount of heat removed per hour/ power consumed. conditioner. Usually, EER of an air conditioner is measured under a specific condition (35 degree C, outdoor temperature; 27 degree C indoor temperature and 50% relative humidity). Before defining COP, consider the conversion from BTU to kW hr(kilowatt hour). The above relation gives the amount of heat removed in ‘W’. Thus, COP is a unit less quantity. Thus, just like EER, higher the COP, better is the air conditioner. Higher the number of stars, greater will be the efficiency or EER. One important thing to be noted here is that EER is given by W/W (which is also the same as COP) whereas we have defined EER by BTU/hr/W. BEE has revises the start rating of air conditioners from time to time. Hence, a 5 star AC in the previous year may become a 3 star AC the next year after revision of rating takes place. You may recognize the validity of the label from the ‘label period’ section printed on the label. Below you will find the current star rating (w.e.f. 1st January 2014). As you can see that each star rating is a range of EER. So it is possible that as AC with EER of 3.29 is rated as BEE 3 star and another of 3.3 is rated as BEE 4 star. It is also possible that AC with EER 3.1 is BEE 3 star and another of 3.49 is BEE 4 star. Thus it is very important that while looking at BEE star rating, you also look at the EER of the AC. If we take the numbers above, we can see that with increase of every star rating there is a possibility of saving up to 14%. So a BEE 5 star rated AC can be up to 35% or more efficient than a BEE 1 star AC and 15-20% more efficient than BEE 3 star AC. The ratings above are based on savings in machinery. In comparison an Inverter tech AC being flexible tonnage AC can save more over BEE 5 star AC. The reason being it not just saves on using efficient machinery but also on flexible tonnage. So the savings can be at least 15-20% more over BEE 5 star rated AC because of savings in changing heat load between seasons and days and nights, and additional saving can be achieved because when you buy a fixed speed AC you oversize even for the peak summer day. And that is why some manufacturers claim up to 60% savings on inverter tech AC (although achieving 60% will depend on how you size the AC). It is true that everything comes with a cost. A 5 star air conditioner will definitely be costlier than a 1 star air conditioner of the same company. And Inverter technology AC costs further more. However, it is also true that the same 5 star air conditioner is much more efficient than a 1 star air conditioner. Hence, a 5 star air conditioner will provide the same amount of cooling using lesser power than a 1 star air conditioner of same tonnage. This leads to savings in operating cost. You may recover the incremental capital cost used to purchase a higher star rated air conditioner in a matter of few years. We typically recommend going for a BEE 5 star rated AC or further Inverter Tech AC if usage of AC is more than 1000 hours in a year and per unit cost of electricity is more than Rs 5 per unit (if the per unit cost is higher, it is recommended for lower the yearly usage also). 1. Kindly ensure that you select the right tonnage of air conditioners. Oversizing or under sizing may either burn your pockets or may not provide you the right comfort level. 2. 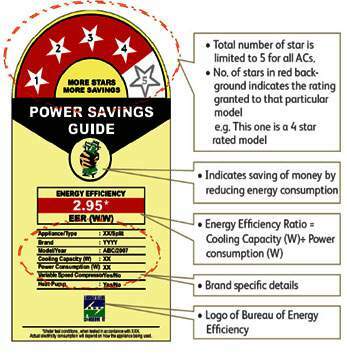 Ensure that the new air conditioners have the revised star rating labels. (Refer ‘label period’ section on the label). 4. Although ‘more stars, more cost’ is true, ‘more stars, more savings’ is also true. After all, when it comes to efficiency, ‘operating cost matters more than capital cost’. Select your city, dimensions of room, usage hours and sunlight checkboxes to get our recommendations. The inputs are on the left size and our recommendations on the right side. Also please note that these calculations are for a regular room in a house. If the room size is more than 400 sq ft then it would be better to call an engineer to do the evaluation.